While many of us desire the latest technology and aesthetics, there’s no way we can operate our machines without a powerful and well-maintained engine. We just can’t get to our destination without it. The same principle, while seemingly simple, applies to your company’s growth strategy. Ironically, filling the machine up with the right gas, and keeping it from breaking down, is more difficult than it sounds. 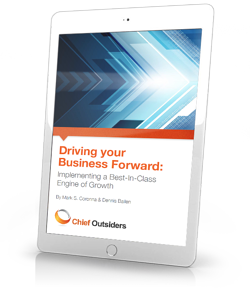 Within our five-part guide, we’ll be tackling the processes, people, organizational capabilities, and platforms that will help you build a sustainable growth machine, and drive your business forward. Download our ebook, written by Mark Coronna and Dennis Bailen, to find out how to succeed in your marketplace over the long term.